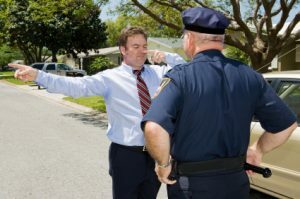 Field sobriety tests (FSTs) can be hard for even a sober person to pass. Several factors relating to the driver, as well as the arresting officer, could lead to faulty results. Call Kramer Law as soon as possible to meet with a concerned Orlando DUI attorney who knows what to do when our clients are faced with a DUI charge. We offer a free consultation. Your Kramer Law attorney can fight to have any or all FST evidence excluded in the case. A Florida driver’s license cannot be suspended for refusing to take a FST. If a driver agrees to a FST and fails, the video and other FST evidence can be used against the driver in court. The difference between a FST and chemical tests that measure blood alcohol concentration is that an FST uses standardized physical and/or cognitive measures to determine if an officer has probable cause to arrest for DUI. There are three standardized FSTs that are used for probable cause for DUI. Nystagmus is an involuntary jerking or bouncing of the eyes. Alcohol or drug consumption can limit the ability to control the eye muscles. To administer this test, an officer will slowly move an object, like a pen or a flashlight, in front of the driver in order to observe the driver’s eye control. The officer can also see whether there is any nystagmus when the driver moved his or her eyes as far to the left or right as possible, or if the eyes have moved 45 degrees to the right or the left. A One-leg Stand test is a divided attention test. To administer this test, the driver must stand with one foot lifted about six inches off the ground and count out loud by thousands until the officer says otherwise. A driver could fail the One-leg Stand test if he or she sways while balancing, uses arms to maintain balance, hops, puts the foot down, or other stability issues. The Walk-and-Turn test involves a driver taking a set number of heel-to-toe steps in a straight line. The test is a divided attention test that examines if the driver can follow verbal instructions and do physical movements at the same time. The driver may be asked to take the same steps in the opposite direction and to count out the steps in the exercise as he or she proceeds. An officer will examine whether the driver is able to keep his or her balance while complying with the instructions, as well as pay attention to how accurate the steps are. An incorrect number of steps, an improper turn, or a step off balance could lead to an FST failure. The Finger-to-Nose test, Romberg’s balance test, alphabet tests, and counting tests are nonstandard FSTs an officer can use to determine probable cause for DUI. These tests may be used if a driver has physical ailments or limitations that could prevent his or her capability to complete one of the three standardized FSTs. In an effort to check for balance, an officer administers the Romberg test by requesting the driver to stand with his or her feet together and lean the head back to look up to the sky while holding his or her arms out to the side. An officer commonly administers an alphabet test by requesting the driver recite the alphabet (without singing). In the Finger-to-Nose test, the officer will ask the driver to touch the tip of his or her nose with the tip of the finger, all the while tilting the driver’s head back as far as possible as his or her eyes are closed. Counting tests could involve an officer requesting the driver count the number of fingers held up or asking the driver to simply count backwards. Just about anything – including nerves, medical conditions, medications, and even shoes – could impact a person’s ability to successfully complete a field sobriety test. An experienced Kramer Law attorney knows the possibilities and how to defend our clients against this highly subjective evidence. Contact a Kramer Law DUI attorney in Orlando as soon as legally possible if you have refused to take a sobriety test or failed an FST. For answers on other DUI-related questions, you can call us at 855-Kramer-Now (855-572-6376).